The Head Office is located on the east side of Sleaford off the B1517 on the Oak Park Industrial Estate. Approaching from the north or south on the A15 or from the west on the A17: This will lead you to a roundabout on the outskirts of Sleaford, intersecting the A15 and A17. At the roundabout take the exit for the A17 signposted to Boston. After approximately 1.1 miles take the exit for the A153 to Sleaford and Horncastle. At the end of the slip road turn right heading towards Sleaford and the B1517. This will lead you to a roundabout after 0.15 miles, take the third exit signposted Sleaford. After a further 0.4 miles take the left hand turn into Oak Park. 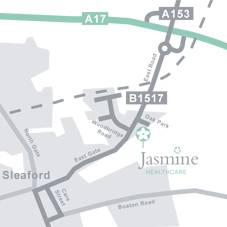 Jasmine Healthcare’s head office is located on the right hand side in the second office block. Approaching from the east on the A17 approaching Sleaford: Proceed along the A17 towards Sleaford, take the exit initially signposted Bone Mill Junction A153 Sleaford and slightly further along signposted Sleaford Industrial Estate. At the roundabout take the second exit signposted Sleaford. After 0.4 miles take the left hand turn into Oak Park. Jasmine Healthcare’s head office is situated on the right hand side in the second office block. Approaching via Sleaford from the south and north: Travel along Southgate or Northgate which will merge into Eastgate with the Market Place to your left. Take the left hand lane and proceed through the traffic lights. After approximately 0.7 miles and just prior to the 40mph sign, turn right into Oak Park. Jasmine Healthcare’s head office is situated on the right hand side in the second office block.